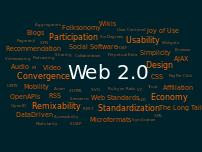 Should Web 2.0 Embrace Localization? After reading Bernard Sunn’s blog post, “Re-Localization Opportunities – Local 2.0” I thought how can Web 2.0 developers incorporate local business owners into their 2.0 business models? Believe it or not, a world still exists outside of the blogosphere or Twittersphere. The Internet is mainstream, but there is still a market of millions of people and who prefer to shop local and fellowship in person rather than in cyberspace. So the question is – How can web 2.0 developers reach those consumers? By somehow targeting local business owners who cater to this market, developers have access to consumers who would normally be off the radar. What a great post. I too found it thought provoking. I predict that we will see more and more Web 2.0 applications incorporate GPS (annotated tagging) in a way that will pull consumers out to local stores, shops, etc. For example, how can BrightKite take its annotated, geo-tagging application and localize it? How can they partner with local business owners, and bring value to them via their application and local BrightKite users? It will be interesting to watch this trend develop. Should web application developers incorporate locailization into their business models? Or should they continue to focus on the cyberspace for revenue generation? Re-Localization Opportunities – Local 2.0 – ReadWriteWeb. Refseek Competition for Google Scholar? RefSeek (rĕf-sēk) is a web search engine for students and researchers. refseek aims to make academic information easily accessible to everyone. refseek searches more than one billion documents, including web pages, books, encyclopedias, journals, and newspapers. In comparison to Google refseek indexes more that just scientific publications, thereby returning more search results. The site also has a a “narrow your search” feature that suggests terms to help you narrow your search for better results. Another noticible difference is there are no ads in refseek’s search results, which is always a plus when your diligently researching a topic and prefer not to be distracted. I’m so excited to be apart of this BrightHub’s milestone!